So, Ruth goes with Naomi back to her home town, Bethlehem. Ruth knows that she needs to be able to support both herself and her mother in law, so she goes to the field to glean (harvest) wheat, as it was the beginning of the barely harvest. The field that she happened to harvest in that day belonged to a man named Boaz. He had heard of Ruth’s kindness, and unwillingness to leave her mother in law after the deaths of her husband and children. Boaz was actually a close relative of Naomi’s, which under Levite law obligated him to marry his kin’s widow, you guessed it, Ruth. So, Naomi sent Ruth down to the threshing floor, and submit herself at the feet of Boaz. However, Boaz knew that another man was a closer kin then himself. Luckily for them, the man was not willing to risk his inheritance, so he gives up his right to marry her. The two are wed, and Ruth eventually becomes the great-grandmother of the biblical hero David. Not exactly the most romantic story out there, but one that a lesson can be learned from nonetheless. An interesting note here; Ruth is often touted as being the first convert to Judaism. This is true, she was born a Moabite, and converted to Judaism. This is often shown through the passage found in Ruth 1:16-17 (seen above). It can be argued that Ruth converted for Naomi, whom Ruth refused to leave, even though Naomi warned her becoming a Jew may not allow her to lead and easy life. It could also be said that Ruth converted for Boaz, whose kindness allowed her to support herself and her mother in law. Also like Esther, Ruth has a Jewish holiday that involves her, called Shavuout. The holiday is a celebration of the anniversary of the day that God gave the Torah to the nation of Israel on Mount Sinai. The celebration, though small, includes eating dairy products, staying up all night and studying the Torah, and reading the book of Ruth. The book of Ruth is read for a few reasons: King David, one of Ruth’s desendants, was born and died on Shavuot; Shavout is harvest time; The gematria (numerical value) of Ruth is 606, the number of commandments given at Sinai in addition to the 7 Noahide Laws already given, for a total of 613; Ruth was a convert, as were all the Jews when the Torah was given; the central theme of the book of Ruth is loving and kindness, as is the central theme of the Torah; and that Ruth was allowed to marry Boaz on an interpretation of the Oral Law. So, it isn’t ever really implicitly stated, but each of the star points exist because they embody the “ideal” of that role. For example, Electa is the ideal mother, Adah the ideal daughter, etc. Which is a little weird when you realize that makes Ruth the ideal widow. How can someone be the ideal widow? The Grand Chapter of Ohio states that it is because “she cherished her family, faith, and inheritance of her husband above her every personal ambition, her original native allegiance, and her originally heathen religion.” Ruth knew who she was, even when everything in her life seemed lost. Imagine loosing your husband, and living with your mother in law, and being so dedicated to her and her family, that you are willing to give up your own identity, your own birthright, to show your love for her. That’s some pretty powerful stuff. Even if we are not yet widows, we can learn from the kindness that Ruth showed to her family, even in times of desperation. It is also a wonderful reminder, I think, to turn to your family in times of need. Although there is an entire book about Ruth, it is not a terribly long one. If you get a chance, pull out a Bible or Torah and read it. 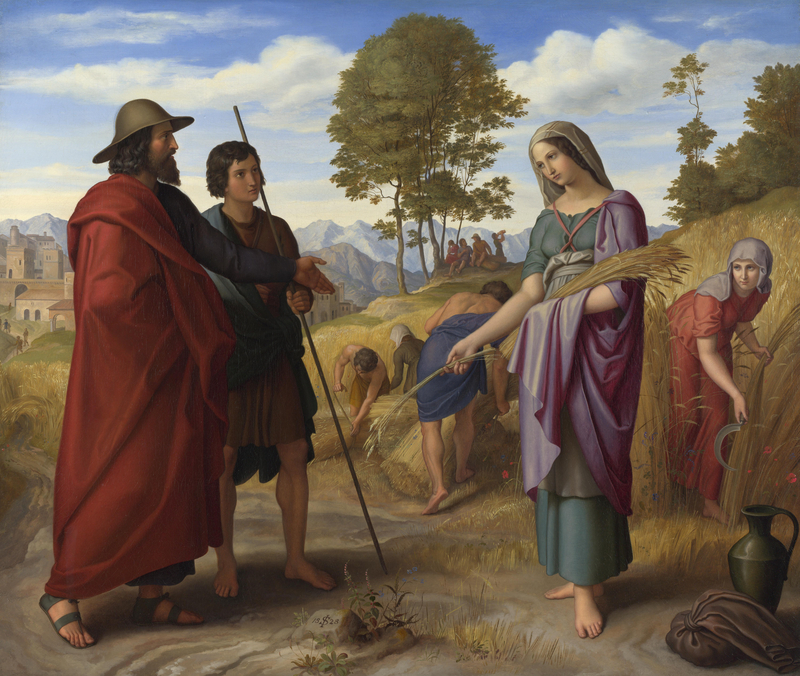 If you are unable to do so at home, you can find the book of Ruth in its entirety here. Feel free to contact me with any questions or concerns, either here, or you can email me atthemasonslady@gmail.com Have a wonderful week!